The forest green camo LensCoat for the Sigma 50-100mm f1.8 DC HSM Art Lens wraps the lens in a 100% closed-cell waterproof neoprene jacket, offering protection from wet weather, bumps, jars and nicks. 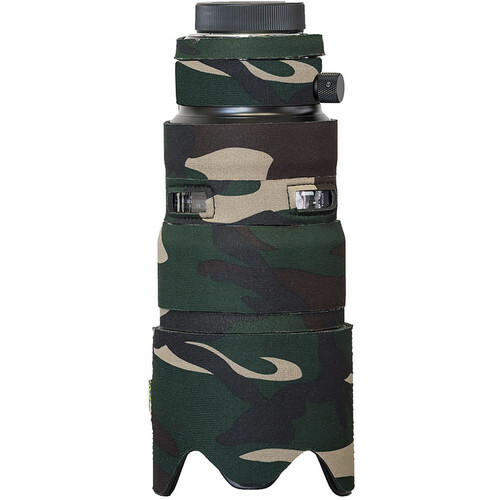 This coat allows your lens to blend in with your surroundings, making it a valuable accessory for nature and outdoor photographers and helping to camouflage your lens from wildlife. It is also useful for sports shooters and photojournalists who are regularly subjected to less than optimal shooting and climate conditions. It has a clear plastic window over the distance scale. The LensCoat Lens Cover provides a thermal barrier, protecting your hands from cold lens surfaces in lower temperatures. It is easy to install and remove, leaving no residue on the lens. Because of the increased protection this covering provides, it can help preserve the resale value of your lens. This classic forest green camouflage pattern is useful for when you are shooting in wooded areas.